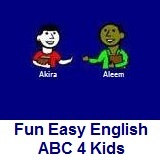 ﻿ Fun Easy English - new writing english alphabet for kids letter v.
Hey kids, try writing the letter V.
I studied the violin for many years. You should always eat your vegetables. This is a nice camping vest.